Home/Clip Strip®/Posi-Lok™ by Clip Strip Corp. Clip Strip Corp. developed the heavy duty Posi-Lok series as an evolution from the original patented display hook strip design. These merchandising strips are built to be very durable, hold more weight than our Econo series strips and keep product displayed very securely. Did you choose one with a header? Ask Clip Strip Corp about printing the header label in full color. You can count on us for all your point of purchase display and merchandising materials, including hook strips, hang tabs, peg hooks, sign holders, and display construction components. Need us to load your strips with your product, attach an S-Hook or other fastener, box them up and ship to you or to the end user? Contact us today about our Kitting and Fulfillment services. Need Custom Printed Clip Strip® Brand Merchandisers, see our NO TOOL/NO DIE stock Strips here. 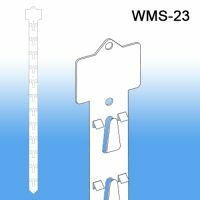 Minimum quantity for "Posi-Lok™ Clip Strip Merchandiser, 12 Hooks, 24-1/2" L, PL-24" is 100. Minimum quantity for "Posi-Lok™ Clip Strip® Merchandiser, 12 Hooks, 30" L, PL-30" is 100. 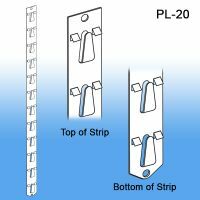 Minimum quantity for "Posi-Lok™ Clip Strip® Merchandiser, 12 Hooks, 22-3/4" L, PL-20" is 100. 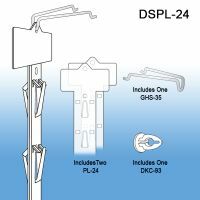 Minimum quantity for "Double Sided Posi-Lok™ Clip Strip® Merchandiser with Hanger, 24 Hooks, 24-1/2", with Header, DSPL-24" is 100. 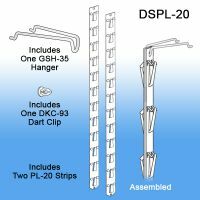 Minimum quantity for "Double Sided Posi-Lok™ Clip Strip® Merchandiser with Hanger, 24 Hooks, 22-3/4", without Header, DSPL-20" is 100. Minimum quantity for "Double Sided Posi-Lok™ Clip Strip® Merchandiser with Hanger, 24 Hooks, 31", with Header, DSPL-30" is 100. 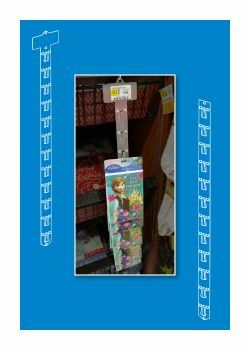 12 Stations, 24-7/8" L Molded Clip Strip® Brand Merchandiser with Branding Header, WalMart® Style Header at 2.125" x 1.375"
Minimum quantity for "WalMart® Approved "Heavy Duty" Clip Strip Merchandiser, 12 Hooks, WMS-23" is 100. Minimum quantity for "Posi-Lok™ Clip Strip® Merchandiser, 6 Hooks, 18.625" L, PL-6" is 100. 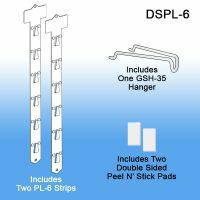 Minimum quantity for "Double Sided Posi-Lok™ Clip Strip® Merchandiser with Hanger, 12 Hooks, 18.625" L, with Header, DSPL-6" is 100.